Peacock bass belong to the Cichlids group. This is the most highly evolved group of fishes in the world. All around the globe we find hundreds of species representing some of the most diverse fish groups in the rivers and oceans. 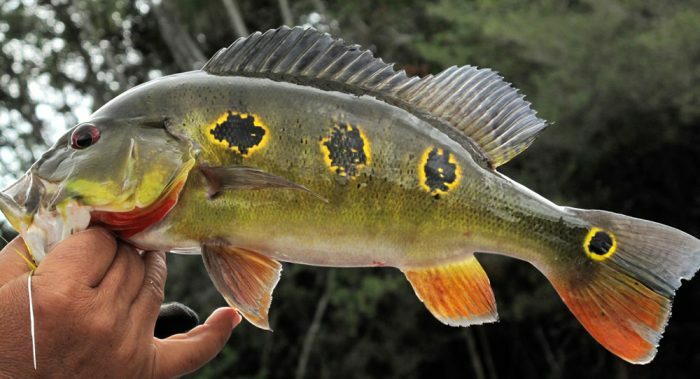 Peacock bass have evolved in the most efficient predators of the group and the mostly on other fish. Their ferocity, their strength, their speed, and their notable size in the Amazon basin enables them to predate on almost every other species there. Their enormous bucket-mouth can engulf a surprisingly large prey, making almost anything smaller than them a good candidate for supper, quite like a largemouth bass on steroids. Fifteen recognized species are found in the Amazon river basin. 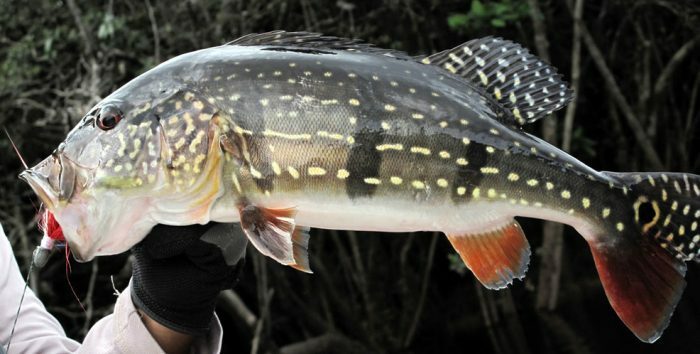 Cichla temensis, (Tucunaré assu – Portuguese / Pavón azul – Spanish), Very sensitive to water temperature and are therefore essentially restricted to the equatorial tropics of the Amazon river basin. Anglers reportedly landed 29 lbs. 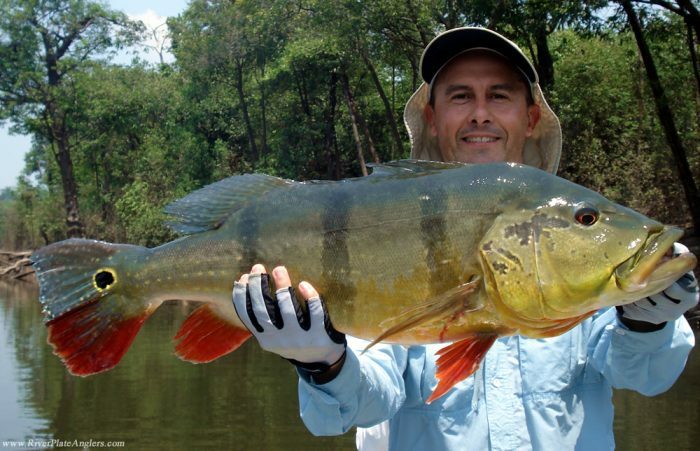 trophies of this species in this area – IGFA all tackle world record has been caught here. Maximum length is about 28 inches. 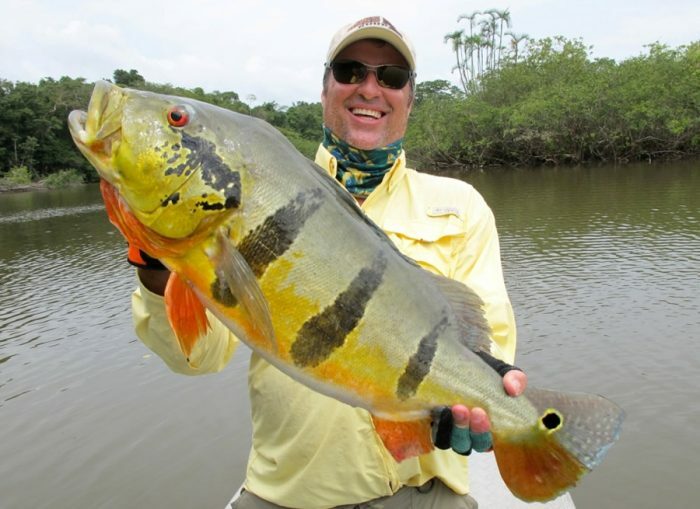 In its bright spawning color phase it is called “assu” in Brazil or “3 bars” in the U.S. They become much heavier and deeper bodied in this phase due to pre-spawn changes and matured gonads. In the “paca” (Portuguese) form, Chichla temensis shows a darker color pattern and a more hydrodynamic shape. Identification is made somewhat complex by the species’ morphological variability. Specimens are observed in two very distinct pattern and color phases with a series of intermediate stages corresponding to their degree of reproductive readiness. The regular spawning pattern transformation process is very gradual – the bars darken, colors brighten and the white speckles disappear. The brilliantly colored assu is in reproductively active condition. The Paca stage has white or yellow dots arranged in four distinct longitudinal rows. Both morphs have three distinct dark bars along the sides of the body that are more faded in the Paca stage, and a distinct black stripe or speckled markings from the eye to the end of the opercular bone (cheek or gill cover), no ocelli are found on the sides or at the base of the second dorsal. Cichla Orinocensis, Amazon Butterfly Peacock, (Barboleto – Portuguese / Mariposa – Spanish), found in most of the same waters as it’s larger relative. These peacocks are identified by the three black rosettes marking their sides instead of the three black bars of temensis. They rarely exceed the 8 pounds mark, but they are very agressive fighters, readily striking the same baits as their larger cousins. 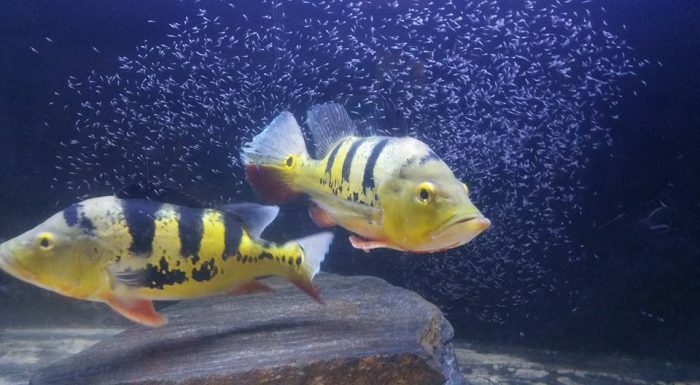 Cichla Monoculus, (Papoca – Portuguese), found in the southern areas of the chichla temensis range they rarely exceed the 5 pounds, but are every bit as aggressive as their larger family species.